The Secure-Tite® is an Adjustable Security Seal used on a wide range of applications. The Secure-Tite is an excellent Adjustable Security Seal designed to help protect against theft and tampering. If the style of Security Seal you require is not listed, please give us a call. We are confident we have the Security Seal that meets your requirements. • 10 security seals per mat. • Larger flag area available – minimum order of 5,000 security seals. 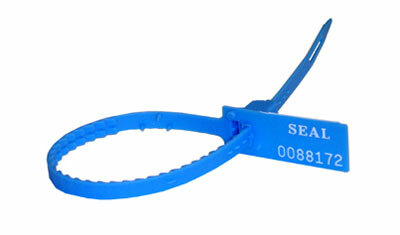 • Sealing tool available to facilitate application. • Polypropylene: Average looped pull apart force is 110 lbs (49 kg). • Nylon: Average looped pull apart force is 215 lbs (97 kg). • Heat stamped name and serial number (7 digits). • Bar coded vinyl labels (Interleaved 2 of 5, Code 39 or 128).